MR LUETKEMEYER’S short fiction has appeared in Sou'wester, Opium Magazine, Del Sol Review, Commonthought, Perversion Magazine, The Ilanot Review, and in the anthology Stories That Must Be Told. He is the author of the memoir The Book of Chuck: A Memorial Compilation of Poetry and Prose. He was awarded an MFA in Creative writing from Lesley University, Cambridge, MA, in 2015. He has been a martial artist, a long distance runner, an outlaw, a fugitive, a husband and father, and sometimes a fool. In the eighties, he spent four years in a state penitentiary for possession of marijuana, an experience he embraces and which informs much of his work and his worldview. He lives and writes between the San Francisco Bay Area and Southern Oregon and favors the trite but true adage that bad roads lead to good stories. Have you ever been intrigued enough by a book’s description to want to get into it right away, but after a few pages, you found yourself wondering what you had gotten yourself into, just what the heck was going on inside those pages and inside the writer’s head? Maybe you were even tempted to toss it aside? I felt a bit like that when I began reading Inside the Mind of Martin Mueller. But something EA Luetkemeyer was doing compelled me to persevere. I was fascinated! Was this book about a very wealthy man who lived on a huge estate, ate the best foods, drank the best wines and drove expensive cars? Or was it about some aging inmate in the penitentiary who was being released shortly after years of incarceration, who had spent his prison time writing and had finally completed his manuscript?Or was EA Luetkemeyer actually creating something even more intricate, like exploring the angst of an author struggling to write, looking for inspiration in the lives of everyone around him…an author who sees himself in everyone else and bits of everyone else in himself? An author battling his addiction to alcohol and mind-altering drugs and looking for validation from his wife and others that his writing vocation is worth pursuing? 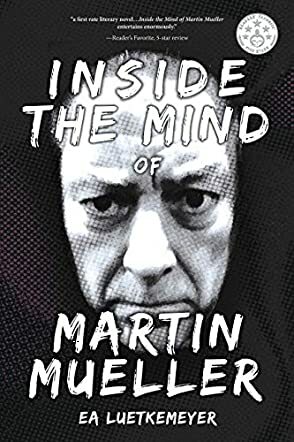 Inside the Mind of Martin Mueller is a very detailed, intricate and erudite piece of writing that does indeed, as the description suggests, leave us with more questions than answers. In a way, it’s reminiscent of art: we each interpret paintings, photos, poems or books in accordance with our own experiences and emotional responses to the work. This book is not recommended for those with a limited vocabulary, or those unfamiliar with history, mythology and “headier” thinking. Nor is it recommended for those offended by explicit language. But it is recommended for those who love a challenge when they read and who enjoy a puzzle. In other words, Inside The Mind of Martin Mueller is a literary Rubik's cube for enquiring minds. Martin Mueller drives a Lamborghini, owns a twenty-six-room manor house, and has a wife named Millie. Every day he swaps his expensive attire to don the blue denim of a prisoner, goes down to the penitentiary in the basement and proceeds to his cell. There, he works on his book, Fragmentation Of The Over-Soul. This is his mission, to solve human beings’ greatest mysteries. He is visited and in return visits the other inmates, diverse and eccentric characters. He’s on good terms with everybody, and everybody seems to genuinely like him. All except for Carl, or Crazy Carl, who is also working on his own material. To be frank, E.A. Luetkemeyer’s Inside the Mind of Martin Mueller wasn’t easy to grasp at first. That being said, the challenge was expected. So, who is Martin Mueller? In the beginning, Martin is somewhat expecting his visitors, and vice versa. What they want and what they are going to say seem predetermined. I made an instant conclusion right away; these people in Lime Ridge－who hold the key to reassembling the scattered shards of the shattered Over-soul of Mankind－are his created characters because he’s writing a book. As the story went on, I had to revise my theory and hold on to subtle ‘clues’, as well as Martin’s repeated declaration that he will “go home in a day and a wake-up”. His discussion with Koot is amusing, fascinating, and confusing at the same time. The ending reveals the ‘truth’ that still lingers in my mind. On the whole, this might not be a book for some readers but, nonetheless, it’s an extremely interesting read. Inside the Mind of Martin Mueller by E.A. Luetkemeyer is a first-rate literary novel with strong psychological undertones. The reader is introduced to a very sophisticated character, a man who believes he has a mission to alter the destiny of humanity. He loves his Lamborghini Espada, which makes him feel as though he were still young. In the garage area of his sprawling estate in the countryside is what he considers a penitentiary and it is here that Crazy Carl works on his masterpiece, a manuscript he believes will change human history and earn him respect from the Illuminati. But is this house real? Is all this happening in his mind or in real life, and what becomes of his project? This is a novel that is both intriguing and psychologically thrilling. E.A. Luetkemeyer’s writing is daring and he uses a unique, inventive formatting style for dialogue which defies punctuation and some grammar rules. I found it interesting, a style that seems to reflect the inner mind of the protagonist. Readers will love Mueller and will, undoubtedly, hear echoes of themselves in him, those thoughts that assail the mind in the hushed hours of the day. The prose is exquisitely good and very descriptive. A description of Crazy Carl hunched over a humming electric typewriter is just one of the many examples of the author's ability to paint powerful images in the imaginations of his readers: “His hair is disheveled, his face unshaven, his soiled blue work shirt hangs limply on his slight frame and all around him his cramped quarters are in disarray.” And there is so much of it in this story. There is a lot to relish in this novel — a great plot structure, a strong psychological conflict, sophisticated characters, and stellar writing. Inside the Mind of Martin Mueller entertains enormously.